Biography of Julian Francis Grenfell. GRENFELL, JULIAN HENRY FRANCIS (1888-1915), soldier and poet, was born in London 30 March 1888, the eldest son of William Henry Grenfell, afterwards first Baron Desborough, by his wife, Ethel Anne Priscilla, daughter of the Hon. Julian Henry Charles Fane [q.v.]. He was educated at Summerfields School, Oxford, and at Eton College, where he reached the sixth form, and became one of the editors of the Eton College Chronicle and of a clever but ephemeral periodical called The Outsider. His contributions to these magazines, and, while he was still at Eton, to the London World and Vanity Fair, give an indication of his literary talent. In October 1906 Grenfell went up to Balliol College, Oxford, where he spent four happy years, surrounded by a brilliant company of friends. Only a temporary breakdown in health prevented him from taking a degree in the honour school of literae humaniores. A man of splendid physique and vitality, he excelled in every kind of sport, and in many branches of athletics, rowing in the college eight, which won the Wyfold cup at Henley in 1909, and boxing for the university. Grenfell had always set his heart on a military career. In 1910 he obtained a commission, and joined the Ist (the Royal) Dragoons at Muttra; a year later, the regiment was transferred from India to South Africa. Shortly after the outbreak of the European War, Grenfell, with his regiment, returned to England, and early in October 1914 accompanied it to France. 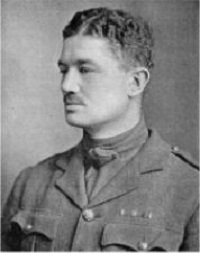 Within a few weeks his gallantry and soldierly abilities had won him a great reputation : 'he set an example of light-hearted courage which is famous all through the army in France,' wrote a distinguished officer in a contemporary letter, 'and has stood out even among the most lion-hearted'. He was awarded the Distinguished Service Order, for a daring feat of individual reconnaissance in November1914, and in January 1015 he was mentioned in dispatches. On 13 May 1915,near Ypres, he was wounded in the head, and on 26 May he died in hospital at Boulogne. He was buried in the military cemetery on the hills above Boulogne. On the day his death was announced (27 May), a poem by Grenfell, 'Into Battle', appeared in The Times. It was at once recognized as one of the finest of the many fine poems inspired by the War. Sir Walter Raleigh wrote of it, 'I don't think that any poem ever embodied soul so completely.... Those who glorified War had always, before this, been a little too romantic; and those who had a feeling for the reality of War had always been a little too prosaic. It can't be done again.' The poet laureate, Mr. Robert Bridges, included it in his anthology, The Spirit of Man (1916). The few other poems which Grenfell left, such as, To a Black Greyhound, Hymn to the Fighting Boar, and The Hills, are in a lighter vein, but all show the same power of expressing poetically his intense love of nature, his vivid delight in life, and light, and energy. Apart from his poetry and his great military promise, Grenfell's short life. is memorable for the deep impression which he made on his contemporaries of all ages. Old and young saw in him the personification of triumphant Youth. This impression is finely conveyed in a sonnet to his memory by Mr. Maurice Baring, while in a family history compiled by his mother, and privately circulated under the title Pages from a Family Journal, there survive not only a series of tributes to him from, many pens, but also a delightful collection of his own letters. Of his two brothers, the elder, Gerald William (born1890), a scholar of Balliol from 1909 to 1913, who won a Craven scholarship in 1911 and obtained his 'blue' for tennis, was killed in action in July 1915, and the younger, too, died from the results of a motor accident in 1926. [E. B. Osborn, The Muse in Arms, 1917; R. Bridges, The Spirit of Man ; Maurice Baring, Poems, 1926; The Balliol College War Memorial Book, 1924] A.F.L. Text reproduced from the Dictionary of National Biography 1901 - 1911 Vol. 1, by permission of Oxford University Press. The photograph is reproduced from the book 'Julian Grenfell - His life and the times of his death 1888-1915 - Nicholas Moseley, by permission of Weidenfeld & Nicholson.